Last weekend, I visited The Hartbeat Ensemble, a theater house in Hartford’s Asylum Hill neighborhood that explores social justice, race, class, and gender in all of its plays and workshops. Their most recent play is “Jimmy and Lorraine: A Musing“. The play highlights the relationship between James Baldwin and Lorraine Hansberry. While they are both well known for their writing and activism, the play brings us into their private space to learn about their hopes, fears, and deep love for each other. Watching the play unfold, I got the sense I was watching something very special. 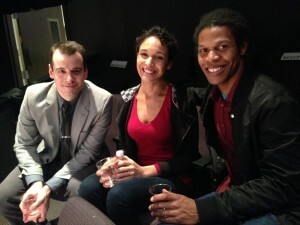 The actors (from left to right in photo) Christopher Hirsh, Vanessa Butler as Lorraine, and Aaron Pitre as Jimmy also portrayed several other characters during the play. They performed the mannerisms and cadence of the characters in a masterful way. Most importantly, they brought us back into a moment in the 1960’s when they asked questions about racial progress that are similar to the questions we are asking today. The Hartford Courant’s Frank Rizzo called the play a “gem” and one of the “best plays of the year”. You can read the review here. If you miss this gem, you will miss one of the best events in Hartford in 2015. The show happens every weekend until Sunday, November 22 (Thurs.- Sat. at 7:30 p.m., Sun. @ 2 p.m.). You can learn more or buy tickets for the show at The Hartbeat Ensemble website.